Architectural and Structural Tension Tie Bar Systems. Nylon rope thimbles are a good alternative to stainless steel thimbles, perfect for forming reinforced eyes in marine ropes, Always match your thimble to the same size rope, eg: 2mm thimble = 2mm rope. 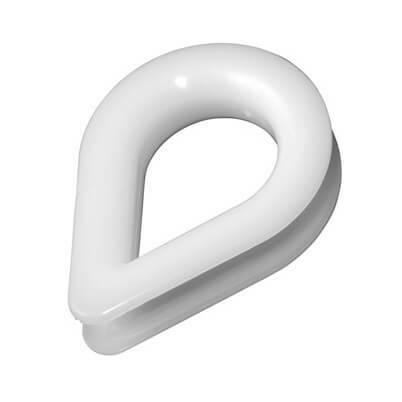 Thimbles reinforce loop eyes in rope and will help to protect rope from surface wear. Low weight, low impact, low cost. Creating a rope loop using a nylon thimble and a ferrule. Simply lace the dead end of your rope through your ferrule and loop the end of your rope around the outer groove of the thimble. Pass the end back through the ferrule and pull-in the dead end to fit tight around the thimble. Once in place, we recommend using a crimping/swaging tool to compress the ferrule firmly onto the rope to hold your thimble loop securely. Once fitted we recommend you load test your rope assembly with a load that is equal or greater than the expected load to ensure that your loop/eye performs safely. What it states is what it is. Good quality product and rapid delivery. A handy sized rope thimble. Mooring Ropes - high quality strong and durable rope. Cruising Ropes - range of braid on braid polyester rope. Hand Splicing Tools for crimping ferrules. 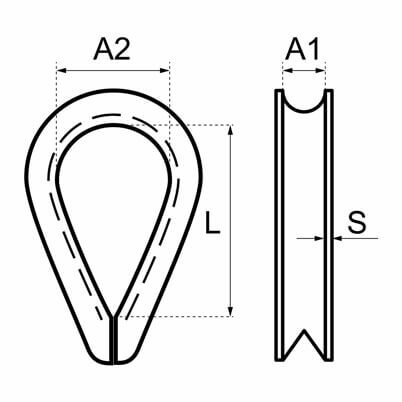 Ferrules and Crimps - For stainless steel wire rope.